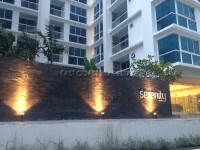 This just completed studio condo is located in the popular location of Wongamat Beach, Soi 18. North Pattaya is now one of the most sought after locations due to great beaches, vast choice of restaurants and the convenience of easy travel into the center of Pattaya itself. This unit is compact but has open views to provide an airy feel. Living area : 29 sqm.